Ask any freelancer or entrepreneur what’s their number 1 challenge in business is and you’ll find that 8 out of 10 have a client acquisition problem. Who to target? Which marketing platform to use? What type of marketing contentÂ to use? How to close the sale? Does attracting new clients have to be difficult? It doesn’t matter if you’re a freelance model, a designer, videographer, writer etc. Your clients will go through a similar process when they are deciding whether to engage you or your competitor. Your goal naturally is to show them that you are the best fit for their business. 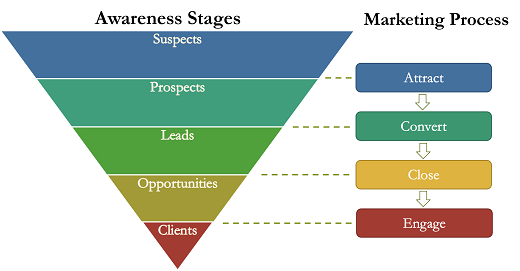 So the first thing you’ll notice about the Client Awareness Stages is that it is shaped like an inverted pyramid or a funnel. Most first time businesses fail to realise their clients go through this process. They use the wrong strategy and tactic without ever understanding why they were not getting the results they want. Well by the end of this article I hope you’ll get better clarity on what to do and how to attract not just more clients but also the right clients for your freelance business. To begin, we first need to understand each stage of this funnel. Think back to the last time you bought something new. It could be something costly like a new smartphone or something as simple as a cup of coffee at Starbucks. Got that thought in your mind? Now think of the process (buyer’s journey) you went through before deciding to hand over your precious dollars. Unfortunately most business owners never take the time to think through this process. Partly because it feels like it is difficult. But just taking 5 minutes to think this process through will do wonders for your sales. You just need to learn how to listen. Let’s take the smartphone as an example. When you decide to buy a new smartphone, it may seem like you didn’t do much consideration. Partly because you are probably buying the latest model of a brand you are already familar with. But let’s jump back in time to the first time you bought your smartphone… how did you decide between Apple or Samsung? iphone or android? These are groups of visitors who have never heard about your company or even to a certain extend… your industry. They have no reason to trust your company or you for that matter. If you have never bought a smartphone before at this point, you may not even be aware of the existence of Apple (a little difficult to image today but stick with me on this). You may have heard about how smartphone is changing the landscape of mobile devices but you know next to nothing about it. Likewise in your freelance business, your prospects may have heard about your type of solution (they heard about hiring a website developer) but they don’t know what to look out for or how to tell who is better. One critical mistake new freelancers make at this stage is to assume price is a factor. Remember… your prospects don’t know much about you or your industry. They are still searching and gathering data to help them make a well-informed buying decision. This is why you want to attract their attention here. Teach them what they should be looking out for to help reach that decision faster. At this point they are aware about you and what you do however they are not ready yet to make any decision. Your goal is to help them understand what separates you from the rest of your competition. If you were considering Apple, you will start to read up more about their camera specs. How the iphone has one of the highest resolution and crystal clear image-taking abilities. All this is done to make you more aware about how a smartphone is like a pocket camera you always carry with you. Emphasize on your uniqueness. What you do better than others and why you are a perfect fit for them. When it comes to online marketing, this is where we turn up the heat. Once your prospects have expressed interest in you, you know they are ready for the sales pitch. Most freelancers make a mistake of selling even before reaching this stage. Some of them run ads (online and offline) to sell to their prospects. Especially if you don’t have the budget to test extensively. Instead by getting your prospects to tell you they are interested in what you have to offer, your job becomes that much easier. You’ve shown them that you are better than your competition. You’ve explained to them why they should consider choosing you. This is the moment you’ve been working towards. This is where you drive home how valuable your product is and close the sale. If you’ve been doing things right, this part should be easy. You won’t have to do much “convincing” as your prospects are already convinced about you have to offer. Congratulations, you have gotten yourself a new client. But your work doesn’t end here as a client can still help your business grow in this 2 simple but powerful ways. I’m sure you’ll agree that it is easier to sell to an existing customer then a new prospect right? Maintain a deeper relationship with your clients and they will help you to sell even more. Growing your business faster. The Art & Science of attracting new clients by using the Client Awareness Stages. A common mistake many new freelancers make is to jump directly into the last stage of the funnel with strategies meant for the first stage. You need to take a step back to examine your market (the people you are serving) and see what are their needs at each stage. And more importantly how you are the solution they’re searching for. Once you’ve locked this down… then, and only then, can you start executing specific marketing tactics for that stage. This is how having the right strategy can help you grow your business fast and at premium prices. The possibilities and opportunities become almost unlimited once you know who your target audience are and your ultimate marketing strategy. How are you attracting your clients now?